We pot our bareroot fruit trees and roses in fiber pots to protect the roots from breaking, to keep them from drying out, and to make it easier for you to plant. Just score the pot and plant it right into your prepped soil using the simple steps below. Dig hole two to three times as wide and one-and-a-half times as deep as the size of the pulp pot, setting native soil aside. Mix the native soil you set aside with planting mix to create your backfill mixture (one part planting mix to two parts native soil). Add E.B. Stone™ Sure Start™ fertilizer to your backfill mix at the rate indicated on the bag or box. 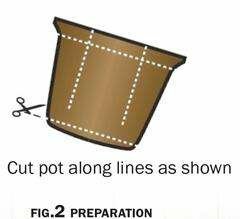 Cut slits down the side and bottom of the pulp pot, and trim the top collar down to the soil level in the pot (See Fig. 2). 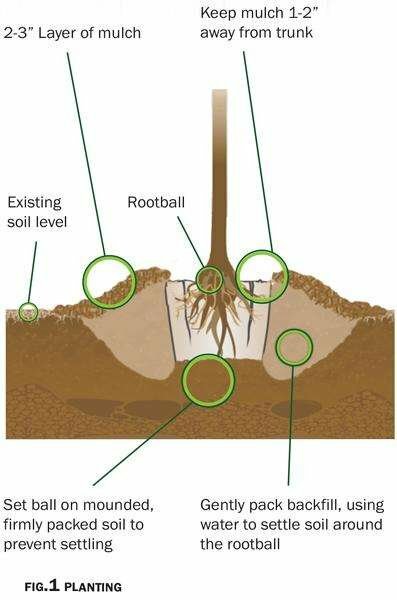 Place the pulp pot in the hole, making sure the top if the rootball is sitting above the existing soil level to allow for settling (See Fig. 1). Backfill the hole with your soil mixture and pack gently to remove air pockets. Use leftover soil to create a basin around the plant to retain water (See Fig. 1).